The Austrian singer and composer Franz Schubert was blessed with neither public recognition nor a long life (1797-1828). Nonetheless, he was highly productive, delighting a small but influential circle of friends, which included poet Franz Grillparzer and artist Moritz von Schwind, with his music. Apart from one (albeit quite successful) public performance of his work, Schubert’s compositions were played mostly for small circles of friends similar to the one shown below. 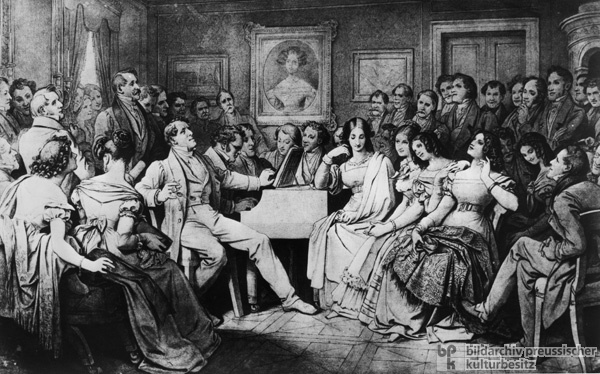 Seated at the piano, the maestro is surrounded by a large and attentive audience, which includes one of his closest friends, the host Josef von Spaun (1788-1865, seated to the left of Schubert) and Johann Michael Vogl (1768-1840, seated to the right of Schubert), a preeminent performer of his songs. Initially building on Joseph Haydn (1732-1809) and Wolfgang Amadeus Mozart (1756-1791) and the tradition of Viennese Classicism, Schubert’s oeuvre represents the first culmination of Romanticism in German music. Sepia drawing by Moritz von Schwind (1804-1871), 1868.